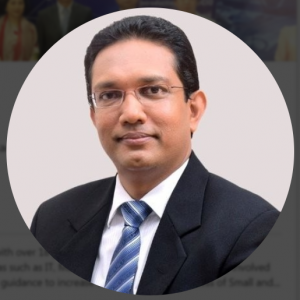 Mr. Upul Dassanayake is a dynamic entrepreneur, management consultant and a trainer with over 18 years of experience in Education, FMCG, ICT sectors. He is a Management Graduate from the University of Sri Jayewardenepura, Sri Lanka and obtained Master’s Degree in Information Technology from Keele University, UK. He is also a Licentiate Chartered Accountant. Upul Dassanayake is currently attached to International Trade Centre, United Nations as National Consultant providing high level strategic advice and guidance to increase the trade competitiveness of Small and Medium Size Enterprises (SMEs) especially ITO/BPO companies in developing countries in general and Sri Lanka in particular. He is also providing Export Strategy consulting services (including International Business Planning, Foreign Trade and Export Strategy Development, export capacity development training and coaching) to SMEs and large-scale companies that are looking to begin their export journey or to enter new foreign markets.